My first impression: Damn! Hal Holbrook got robbed again! 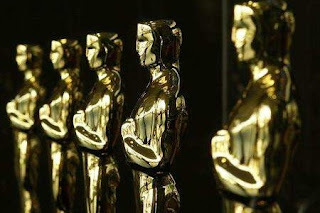 My other Oscar observations can be found here. Never met you in person, Joe, but a belated thank you for writing about the Holbrook film early and often. It was because of you that I saw it -- its East Coast release was pretty minimal -- and it ended up making my Top Ten. And kudos for -- in light of the recent plagiarism story, and others -- sticking up for old-fashioned ethics. Always seemed to me that if it appeared in quotes, somebody else said it; if it didn't, they were your words alone. But apparently not everyone realizes that. Keep at it and keep healthy. Funnily enough, Stephen, I, too, was a big fan of Famous Monsters of Filmland (as you indicate in your Star-Ledger bio) during my youth. But my first letter to the editor ever printed in a magazine appeared in... Castle of Frankenstein. My father bought me a second-hand typewriter at an impressionable age -- right around the time I was reading the capsule movie reviews in Castle of Frankenstein. I used to keep track of horror and sci-fi movies I saw by typing comments about them on index cards. That let to my becoming a film critic. So, really, it's all the fault of that damn magazine.